On LEDs and LEDZ The Lure of Continuous Lights: HMI, HID or CDM? While the average camera enthusiast may not be familiar with the name Frezzi, those in the world of electronic news gathering (ENG) and broadcasting most certainly are. Frezzi lighting products are often spotted atop professional video cameras and their daylight balance HMI products are among the more popular sun gun fixtures available in the market. With the growth in HDSLRs among broadcasters, Frezzi has taken an integrated approach and offers platforms to its customers that address the need for lighting, power and stabilization. This integrated approach is not new for Frezzi: It is consistent with their product offerings for traditional video cameras. But they are one of the few companies offering this kind of integration solution for HDSLR users, and in doing so, may undoubtedly find their product have appeal to a far broader market. Kevin Crawford of the New Jersey-based company provides us with an interesting look at the company and its latest products. Q: Frezzi is probably best known for its lighting products. What sets Frezzi apart from the other lighting companies? KC: Frezzi has been innovating and designing portable lighting and power packs for television news since the beginnings of terrestrial broadcasting. My grandfather, James Frezzolini, founded the company while working as the Chief News Reel Cameraman at WPIX Channel 11 here in New York City. As a skilled machinist and inventor, he developed the world’s first portable lights for use with 16mm Bell and Howell Film cameras used for news at that time. It all started there and continued for the TV news industry with a broad range industry firsts, including lighting, power packs and Frezzolini 16mm film cameras. We offer photographers and videographers their choice of lighting products; tungsten, HMIs, and LED replacement lamps. Frezzi is the only company offering a line of highly portable and lightweight HMIs, from our 15W Micro Sun Gun to the 400W HMI Super Sun Gun. They all can be DC battery-powered, making them great field lights. Additionally, Frezzi lighting products are made and serviced here in the USA. Q: What made Frezzi decide to enter the market with HDSLR compatible products? KC: It was an easy decision for us. We have been providing Frezzi Mini-Fill lights as continuous light sources to the still photography market for years. We actually saw a growing number of still photographers using tungsten fill lighting rather than flash units for some of their glamour and wedding work. This eliminated harsh flash shock while utilizing continuous lighting for highlighting and accenting. Also, you cannot replicate the warmth and full color spectrum of a good tungsten lamp source. Given the fact that our products are designed to be portable, support and improve the handheld camcorder shooting experience, expanding the Frezzi product line to include HDSLRs was a natural. 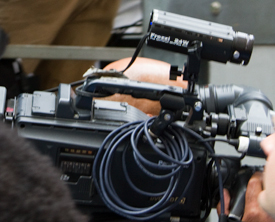 Since some of the products we offer for HDSLRs are adaptations of products originally used for and proven to work with professional broadcast cameras. Q; How important is the lighting component of the HDSLR rig or system? What advantage does the Frezzi approach offer? KC: The lighting is extremely important even though the HDSLR can shoot at low light. We’ve seen some good available light video, but when a subject properly lit [with a Frezzi,] you’ll see a dramatic improvement in image quality. The image will be more vivid and the colors will really “pop” as the light will help to separate the subject from the background. You’ll see that “sparkle in the eyes” and bring your subject to life. Being low light sensitive is good with the HDSLR because you can gently wash your subject with accent lighting by adjusting the dimmer control just enough to bring up the warm, golden skin tones and fully saturated colors while having the camera’s sensor working in the “sweet spot” for an ideal image. Our rig has the advantage of the light being powered by a Frezzi battery on the back of the shoulder support which also serves as a counterbalance as well as a power source for those using a monitor and/or other accessories. 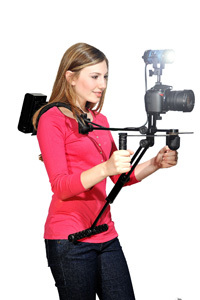 Q: You have two types of rigs available: one which is hand held and the other which is shoulder mounted. Can you tell us about them? KC: Customers soon find out HDSLRs are heavy and cumbersome to shoot video, creating painful wrist and arm fatigue over time. This makes it difficult to acquire smooth, professional-looking video when shooting for extended periods of time. acts as a counter-balance and power source for the Frezzi light or any other 12V accessory. As you know, having a balanced rig helps keep the camera steady when doing handheld and roving shots. advantages the Stable-Cam offers is a lower waist boom which provides an additional point of contact for stabilization and relieves the weight from handholding. You can easily adjust focus and camera settings using the Stable-Cam as 100% of the weight is balanced on your shoulder and waist. 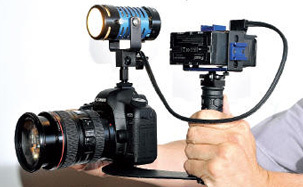 Many users refer to it as a “Human Tripod” since it offers the ability to shoot for hours without any wrist or arm fatigue while holding the shot smooth and steady. Again, our high capacity batteries which can power the Frezzi light, monitor or any other 12V accessory are integral to the system. Using one of the Frezzi HDSLR Stabilizer rigs results in the camera and accessories being both balanced and more manageable which makes for smooth and professional looking images and video clips. We offer both stabilizers in “kit” configurations which include the Stabilizer, a MINI-Fill and a battery. There are different kit configurations available with MSRPs between $1150 and $1950. Q: Your mini “sun gun” can utilize a tungsten or LED bulb. What factored into your decision to offer both? KC: The Frezzi Mini-Fill Dimmer is an industry standard video light used by tens of thousands of professional broadcasters around the world. It accepts any standard MR-16 lamp, with a GX5.3 socket base, up to a 100 Watts. With the wide proliferation and availability of LED MR-16 type replacement lamps, LEDs are a logical choice when lower power consumption and long run time are considerations. LED MR-16 lamps are “direct” lamp plug-in replacements, suitable for any MR-16 fixture. So it’s a simple evolution of technology that has made this possible. Being able to switch back and forth between Tungsten and LED has its advantages based on shooting and lighting conditions as well as the photographer’s intent. Q: What kind of run times are you estimating with the batteries that come with the systems? KC: Run times depend on the wattage of lamp and accessories being powered, but in general when using our Hand Held Rig and Power Block battery, the Frezzi Mini-Fill Dimmer with 35W Tungsten lamp will run for almost two hours continuously; with an 8W LED replacement lamp, the run time jumps to over eight hours of continuous light at 5500 degrees daylight color temperature. On our Stable-Cam powered rig which uses a more robust battery, the 35W Tungsten Mini-Fill Dimmer will run almost 2.8 hours With an 8W LED replacement lamp will run for over 12 hours. But keep in mind, with the addition of a LCD monitor and other accessories that require power, the battery run time will decrease. Q: Can your HMI units be fitted on the HDSLR rigs, and if so are there any advantages to using them over tungsten and LEDs? Frezzi HMIs can be fitted to the HDSLR rigs with ease. Frezzi lighting has standardized shoe mounting and power connectors making substitution simple. The advantage of HMI is their high output at daylight color temperature 5600K. When shooting outdoors in direct sunlight or when the subject is back lit, HMIs are unequaled among continuous lighting products in their ability to light a subject effectively to eliminate shadows. Tungsten lamps need to be color-corrected from 3200K to 5600K which will reduce their light by approximately one f-stop. Most LED sources at this time do not have enough throw and fall off very rapidly to be effective outdoors in direct daylight. Some of our customers are using our 15W HMIs on HDSLR rigs as a fill-in light, and our 24W HMI stand mounted, as key and back lighting. Being all battery-powered, small and extremely portable makes them great as HDSLR portable light kits. While these customers are using the lights as portable lightings kits with “HDSLR for News” crews, documentary work and ENG crews, we believe they will be attractive alternatives for other segments of the HDSLR market. Frezzi HDSLR support and light products are available now. For more information on these and other Frezzi products visit: http://www.frezzi.com or call (800) 345-1030. Thanks to Kevin and James Crawford of Frezzi. All images in this entry and in this blog are copyrighted and used with permission.